These light oak chart holders is mounted vertically on a wall to save floor or counter space in a shop or professional setting. 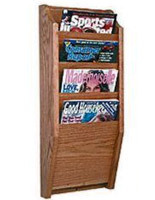 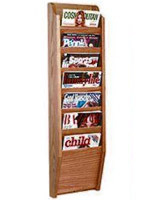 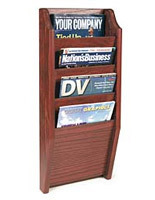 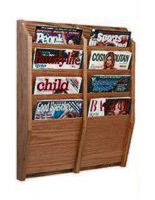 The wooden fixture has two columns, each with four pockets, to dispense promotional materials and magazines. 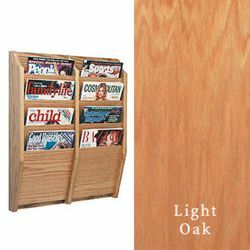 Each of these light oak charter holders stores newsletters neatly, making it easy for customers to identify what they need. 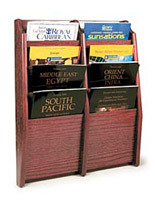 Order these vertical presentations by 1 p.m. for same-day ship when in stock! 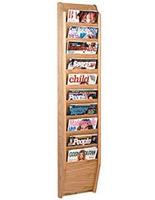 These light oak charter holders, also known as literature stands, make titles visible due to the thoughtful design. 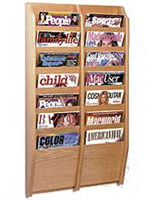 Floor space is saved by using wall mounts!